WJES is headed to the farm for Book Fair 2019. 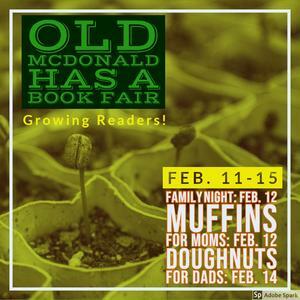 This year our fair's theme is "Old McDonald Had a Book Fair: Growing Readers!" Click on the headline for more information. The Book Fair will be open daily from 7:30 am - 4:00 pm. Students are welcome to come, look, shop, and buy during library classes and with teachers' permission. All money raised will be used to buy new books for the library. The Book Fair will have three special events during the week. Muffins for Moms is on Tues., Feb. 12, from 7:30 am - 8:00 am. Mothers, grandmothers, and any special lady in students' lives are welcome to come shop with them. Food and refreshment will be provided for the adults. Doughnuts for Dads is on Thurs., Feb. 14, and will operate during the same time and way Muffins for Moms will. On Tuesday night, Feb. 12, from 5-7 pm, the library will host its Book Fair Family Night. The fair will be open for shopping, and we will have activities such as goat-petting, a hayride, planting seeds with 4-H, and a digital barn breakout game!